Fibre backed discs are still one of the most popular methods of grinding metal when some flexibility in the abrasive disc is required. 1. 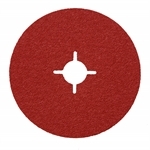 Aluminium oxide discs (Red). Suitable for mild steel and cast iron. 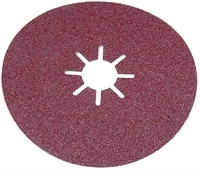 Best for use on aluminium or when used as a grinding pad in advance of beginning a polishing process (aluminium oxide discs leave a less coarse scratch than other equivalent grit discs). 2. Zirconia discs (Blue). The best general purpose disc for more aggressive applications on mild steel. We recommend our zirconia discs for general stainless steel fabrication work where they are an excellent all round disc. 3. Surface Conditioning Material (SCM). For cleaning and surface finishing all steels. Please note all fibre discs should be used with a back up pad for safe operation. Follow the link off the relevant disc page to select the right back up pad. Zirconium fibre backed discs are best for stainless steel and harder alloys and also give longer life on mild steel. Our Aluminium oxide fibre backed discs are ideal for general metalwork on mild steel and cast iron. These are great quality discs at superb value prices. Fibre backed surface conditioning discs for controlled stock removal and fine finishing.